Hi! I am Maartje. I’m an interior architect and an avid user of Floorplanner. A few times a month I will blog some ins and outs about interior design and I will give you tips on how to use Floorplanner. This first week I will show you how to analyze and measure spaces before you use Floorplanner. A good research will save you lots of work afterwards! Be patient while analyzing your space. Work systematically. To inspect a space or room you will need some tools. Most important are a tape-measure or laser-marker, a piece of paper, a pencil and a camera. If you are inspecting a big location it can be helpful to check if there is some existing documentary. You can use this as a base for your measuring. Measure the width and length of the space and sketch a square or rectangle in same ratio on your paper. It doesn´t need to have the exact same ratio as you space. You just need some guides (In the example I indicated the rectangle with a dashed line). 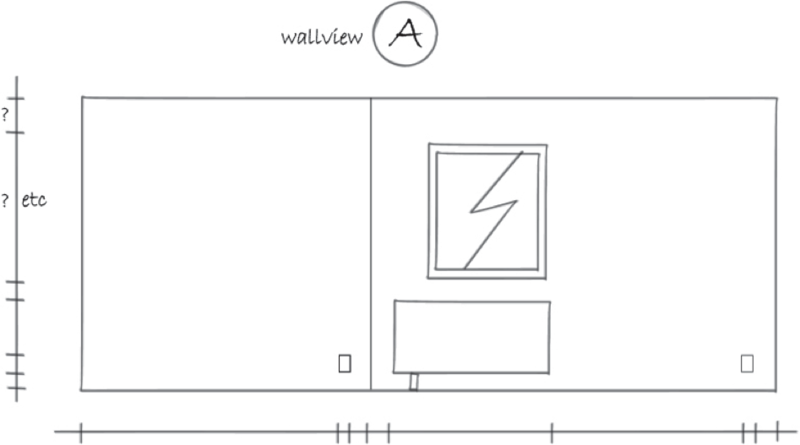 Locate doors, windows, radiators, chimneys, stairs, niches and power outlets and sketch them in to your drawing. To indicate outlets you can use an X-sign. Indicate the direction in which doors rotate and mark all walls with a letter (A,B,C,D). Now you have a good base to write down the dimensions. The measurement is best done by two people. If you´re on your own it´s easier to use a laser-marker. 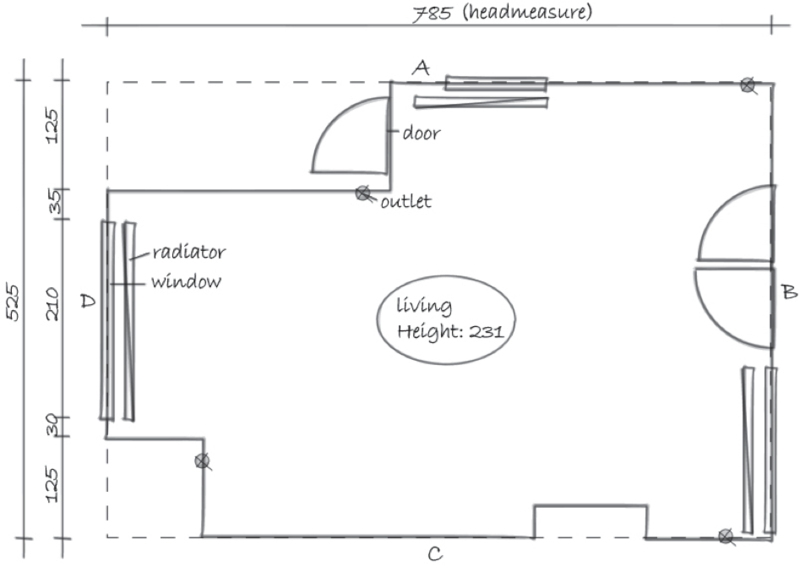 Before you start your detail-measurement, draw the head measure on the outside of your plan. Now measure everything clockwise. Write them down in cm or in mm (In the example I used cm). To point out heights of your windows, doors radiators etc. sketch all side-views down and measure all important heights. Mark the views with the right letter. Last but not least is taking pictures. When you´re working out your project it´s always helpful to have good pictures to review. Take pictures from every corner of the room to the opposite corner. Then stand in the middle of the space and make pictures of every wall. Shoot some important details as well. Next post I will explain how to process all your research into Floorplanner!